You know those weeks where you just feel like you need a little something extra special to start things off with a bang? Well, this is one of those weeks. Things have been so crazy at work recently that I just wanted to give my nails a little party. 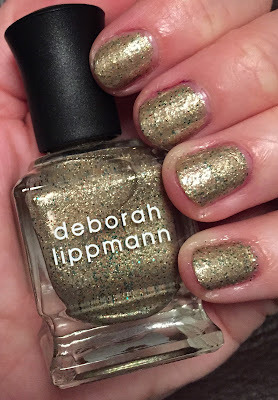 Enter Deborah Lippmann Fake It Til You Make It. This color is from the Fall 2013 Jewel Heist Collection (all of the colors in this collection are pretty darn stunning). Fake It Til You Make It, in particular, really spoke to me. I absolutely love the gold base, which is very similar to Deborah Lippmann Believe (my all-time fave color from Deb). But what makes this color stand out even more is the scattered green and pink microglitter. Two coats yield perfectly even, opaque color with tons of the glitter making its way onto the nail. I also love the finish of this polish, which is somewhere between a shimmer and a glitter (a glimmer, if you will). The texture is fairly smooth, although a swipe of top coat will definitely help to smooth it out more. With this polish on my nails, one thing's for certain. I don't feel like I have to fake ANYTHING. Deborah Lippmann Fake It Til You Make It retails for $18 at beauty.com. I am a HUGE fan of Queen Deb's creations! Love this one. I love the microglitter colors! This is so pretty! How do I not have this? Yes to glimmer :-) I like this holiday-ish mani! So pretty! I don't have any Deborah Lippman nail polish, this might end up being my first one.